As we open a new calendar for 2018, here’s a look back a New Year’s postcard sent in late December 1909 to Pearl Bracey of Bridgeport marking the start of 1910. This lovely postcard hints at the festive season with its holly leaves and points to the year ahead with the 1910 half-year calendar pages. The message reads “Wishing you all a very Merry Xmas & a Happy New Year. Oliver & Bertha”. From all of us in the Grace Schmidt Room, I’d like to wish everyone a very Happy and Healthy 2018. We look forward to sharing the treasures of the GSR with you and hope that you’ll drop by to see us in the New Year. I wanted to take this moment to wish everyone a Happy New Year from the Grace Schmidt Room of Local History! We’ve had a busy year and look forward to sharing our finds, discoveries and insights with you here on the blog. Be sure to come check out our displays, book scanner and more in the GSR! Have a safe, happy and healthy 2017! I recently came across this New Year postcard in the collection and wanted to share it with you. I think that I am feeling nostalgic for the white Christmas that we missed this year. 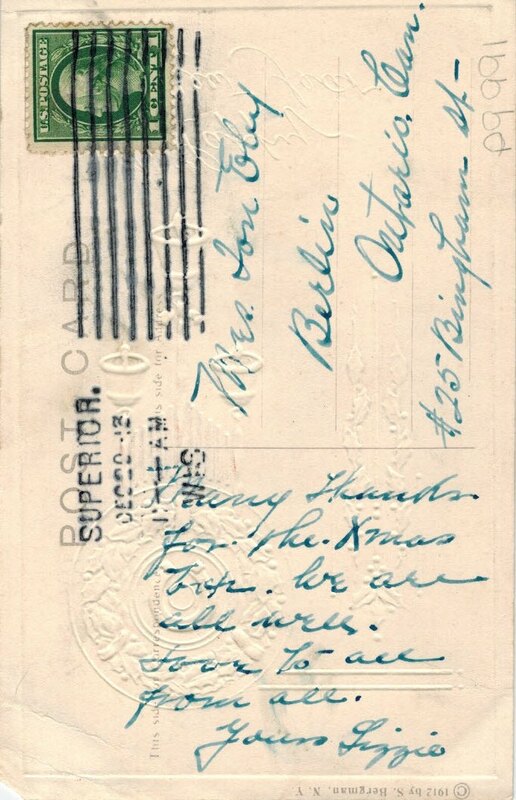 The postcard was postmarked 31 December 1914. It was addressed to Miss Ina Eby, Chapel Street, Berlin. It had been sent by “Lulu”. Ina Eby was the daughter of Ezra Eby and Mary Ann Clemmer. She was born in Bridgeport on 24 January 1884. She had 4 brothers, Ira, Ion, Leo and Odo. According to the 1911 Census of Canada, she lived at 41 Chapel Street, Berlin with her mother and worked as a sample maker in the White Wear factory. Ina died at the age of 72, on 18 February 1956, and was buried at First Mennonite Cemetery in Kitchener. From all of us in the Grace Schmidt Room, Best Wishes for a Happy New Year! In this day and age of e-cards, Facebook and Twitter, the elegance of the handwritten word and card is often forgotten. 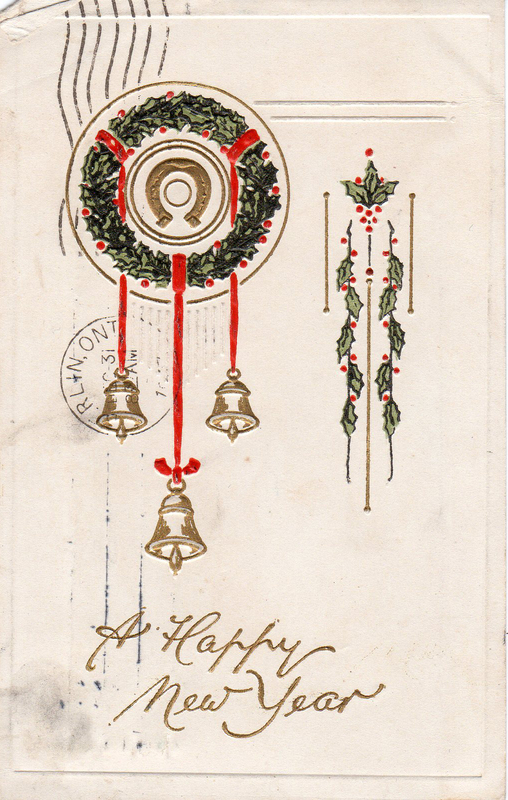 This century old New Year’s greeting postcard reminds me of the pleasure of receiving notes by post, the thrill of recognizing familiar handwriting and a short personal message. This card was sent from Superior, Wisconsin, USA to Berlin, ON. 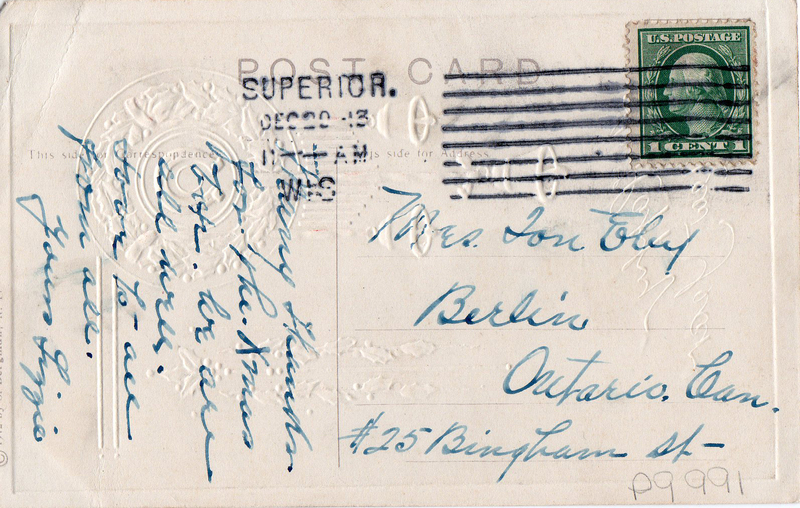 The 31 December 1913 postmark lets us know that it was received just in time for New Years. The recipient was Martha (nee Polzin) Eby, wife of Ion Eby. The Ebys resided at 25 Bingeman Street, Berlin. According to Martha’s grave at Woodland Cemetery, she died in 1939. The card reads: Many thanks for the Xmas [gift]. We are all well. Love to all from all. Yours Lizzie. Best Wishes for a Happy, Healthy and Peaceful New Year.